Join us for a conversation with Cuban writer Leonardo Padura and Cuban filmmaker and script writer Lucía López Coll. 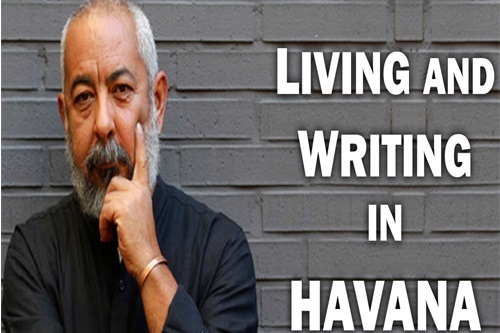 We will discuss Padura's writing career and López Coll's film Vivir y escribir en La Habana [Living and Writing in Havana], which explores the relationship between Padura's writing and the City of Havana. We will also have the opportunity to ask Padura and López Coll about the experience of adapting Padura's novels for the limited series Four Seasons in Havana, currently available for streaming in the US. Leonardo Padura has published two dozens of books, among them a number of detective novels featuring Mario Conde. He was awarded Cuba’s National Prize of Literature and the Premio Príncipe de Asturias de las Letras of Spain, among many others. Just this week Leonardo Padura was awarded the Barcino Historical Novel Prize. The conversation will be in Spanish, but some assistance will be provided for those who want to ask questions in English.